Etsy is the global marketplace for unique and creative goods. It is home to a universe of special, extraordinary items, from unique handcrafted pieces to vintage treasures. The company aims to keep human connection at the heart of commerce. That’s why they built a place where creativity lives and thrives because it’s powered by people. They help their community of sellers turn their ideas into successful businesses. The Etsy shop connects them with millions of buyers looking for an alternative — something special with a human touch, for those moments in life that deserve imagination. The platform empowers sellers to do what they love and helps buyers find what they love. The company was started in 2005 in Brooklyn when Rob Kalin, Chris Maguire, and Haim Schoppik came up with the idea to set-up an online platform for creators to sell their goods. Within 2-3 years of its launch, the company saw almost 500,000 registered users on its platform. Continuing with its success, the Etsy store also allowed the sale of manufactured goods on their site instead of only handmade goods. This policy change allowed for a wider user base and increased marketplace activity. Step 3: If you want to add more products to your cart, you can continue shopping. To buy the products click on the cart icon at the top-right corner of your page and click on the ‘Checkout’ button. 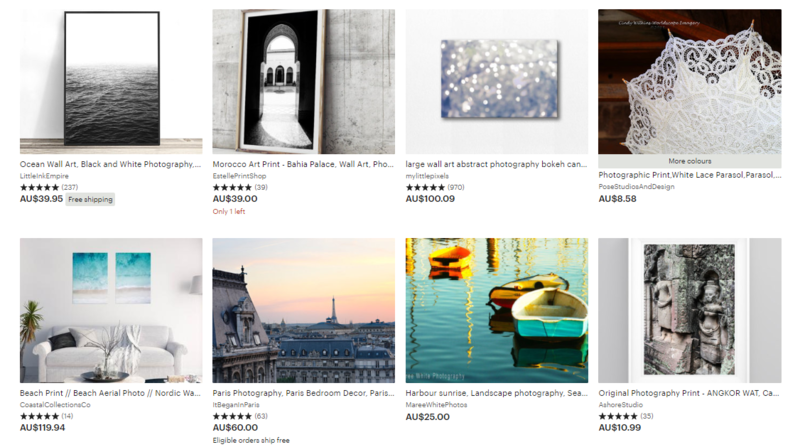 To know the top Etsy sellers, you can even read reviews by other people on the site. Step 4: Enter your delivery and billing details in the next form. From there, you will be redirected to the payment page. In case you have an Etsy coupon code or Etsy promo code, don’t forget to enter it in the box provided to claim your discount. Enter your payment details and once confirmed, you will receive an order confirmation via email. Buyers on the online Etsy shop also have several opportunities to get their products at a discount based on deals offered by the sellers. Each seller on Etsy offers their own discount codes and offers for their shop. They might share an Etsy coupon code, or they might advertise a sale on particular listings. If a seller shares a coupon code with you, you can automatically apply it to your account by clicking a link provided by the seller. You can also manually apply it to your purchase during checkout. 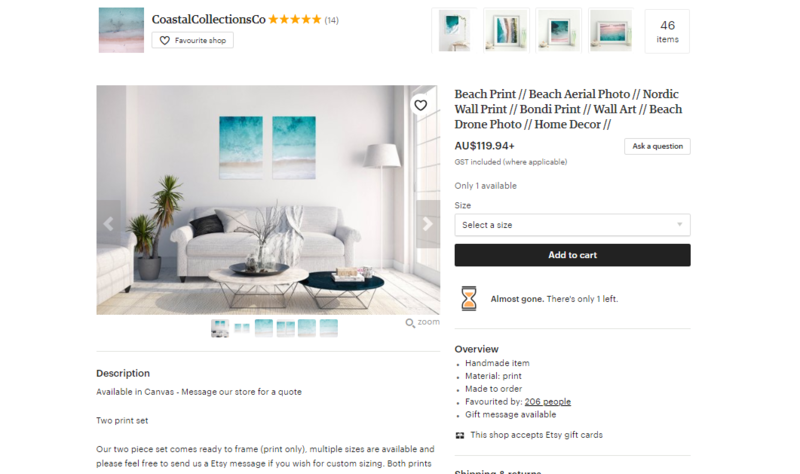 If a seller has items on sale, you’ll see the discounted price displayed across Etsy search results and on the shop’s homepage. You can filter your search results by "Free shipping" and "On sale." Some listings may contain both types of discounts. Some sellers may offer multiple discounts for the same item. You can apply a maximum of two discounts to an eligible item, but one of the promotions must be for free shipping. If a shop is running multiple promotions at the time of your purchase, Etsy will automatically apply the best discount to your order. Some sales may require you to purchase a minimum quantity or amount in order for the discount to apply to your purchase. If you're having difficulty redeeming a coupon code, please contact the seller to make sure the Etsy code is still available. Step 1: Visit the ShopBack website and click on the Etsy store at the bottom of the homepage. You can also use the search box to find the link to the store. Step 3: Look for the latest Etsy promo or Etsy voucher code in the Etsy discount codes and coupons section. 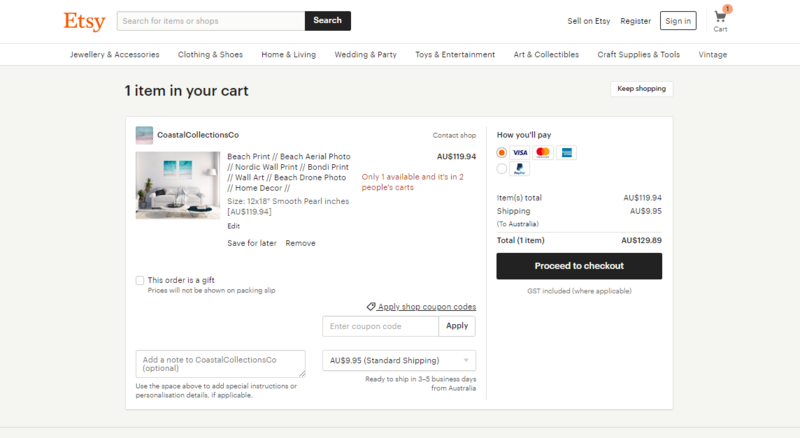 Step 4: You will be redirected to the Etsy website to browse and select the items. To cancel an order look for a Request Cancellation link by the seller. If you don't see that link, click ‘Contact The Shop’ to ask the seller directly. If you need to cancel your order, check the seller's policies and contact your seller for help. If you don't see a Request Cancellation link, click Contact The Shop to the right of your order to open a new conversation. To request a cancellation this way, you must have an Etsy account. If you checked out as a guest, find the receipt that was emailed to you after purchase. Click the order number, and you'll be taken to Etsy where you'll be prompted to create an account. Then, follow the instructions above. If you don’t want to create an account, you can contact your seller by replying to the receipt email. Before purchasing, it is best to locate and get familiar with the shop’s Returns & exchanges policy. You can view this information by clicking the Policies link at the top of their shop homepage. You can also go to the shop policies link in the listing overview on an individual listing page. Specific questions about a shop’s policies are best answered by the seller. You can use Conversations to contact the seller before ordering to get clarification. Choose the best description of your issue. Select “We’ll call you”. You’ll see this if Etsy offers phone support for this particular question. Provide your phone number and a brief description of your issue. You should receive a call back within 15 minutes of your request at the number you shared. In addition, you can also follow the brand on social media to stay tuned to the latest updates.